Power up your video card"
This small program is designed to tweak the performance of your video card in order to get the highest performance. This is useful for gamers or if you are using programs that use heavily the graphic card. 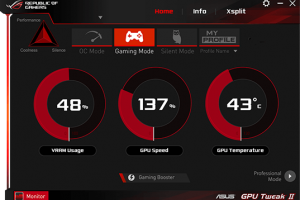 Tweaking and overclocking graphics cards of AMD and NVIDIA adapters is now possible. ASUS has come up with an application, the ASUS GPU Tweak Utility, which is totally free. It is not necessary that you must have a board made by ASUS so that this software will work for you. The program can work on any board that your PC has installed. The software gives you complete control over many features of your card such as fan speed, memory, CPU voltage and CPU Clock. There is an added feature for monitoring the voltage, installed memory and temperature of your adapter as well. Default clock speed, memory type, and device driver information can be viewed on the information panel. It is a powerful tweaking tool which allows gamers and other persons who need solid tweaking options for their graphics hardware. ASUS GPU Tweak is licensed as freeware for PC or laptop with Windows 32 bit and 64 bit operating system. It is in video tweak category and is available to all software users as a free download.